WASHINGTON, Dec. 24, 2013 – On Dec. 21, at a racetrack complex near Miami, eight robots took their first steps into the future, one that scientists at the Defense Advanced Research Projects Agency envisioned for them as the world watched the Fukushima Daiichi nuclear disaster unfold in 2011. Soon after, they established the DARPA Robotics Challenge. The challenge’s first event took place in June with 26 teams from eight countries and whose last event will begin at the end of 2014 at the DRC Finals with a winning team, a robot, and a $2 million award. DARPA launched the challenge to help develop robots that can work with people to respond to natural and other kinds of disasters. The competition -- consisting of robot systems and software teams -- was designed to be very difficult, at a time in robot evolution when real robots generally work on stationary bases in factories doing clearly defined repetitive tasks or in controlled laboratory environments, said DRC program manager Dr. Gill Pratt. Participating teams, down from 100 when the program began, to 16 at the DRC Trials 2013 held Dec. 20-21 at the Homestead-Miami Speedway in Florida, represent some of the world’s most advanced robotics research and development organizations. The teams, DARPA officials said, are collaborating and innovating on a very short timeline to develop hardware, software, sensors and human-machine control interfaces that will allow their robots to complete a series of tasks chosen for their relevance to disaster response. In Florida, while thousands of spectators watched and often cheered, the 16 international teams, representing industry, academia and NASA, guided their robots through as many as eight individual, physical tasks that tested the robots’ mobility, manipulation, dexterity, perception and operator-control mechanisms. Eight teams scored the highest number of points for all tasks completed and are headed for the 2014 finals. Pratt said DARPA has $8 million to divide among the teams for further development, depending on individual team contract negotiations, to prepare for the finals. 8. 9 points, Team Trooper, Robot Atlas, lead organization: Lockheed Martin Advanced Technology Labs. On the first day of the trials, speaking from victory lane next to the race track, DARPA Director Arati Prabhakar thanked the teams for their hard work, ingenuity and collaboration with DARPA. “We will show the world what’s possible, what we need to work on, what it’s really going to take for robots to step up when disaster strikes,” Prabhakar said, adding that the teams would help build a better future with robotic capabilities. Dr. Brad Tousley, director of DARPA's Tactical Technology Office, said DARPA was happy with the teams, the robots and the enthusiastic crowds. After the closing ceremony, during which Pratt awarded certificates to the eight winning teams, the scientist briefed the press, summing up the DRC’s results. “The technology has shown itself to be more advanced than I had expected -- not by much but by a little bit. The robots were more reliable than we initially expected -- not by a lot but by a little. But that’s only half of the picture,” he explained. In the Miami trials the robots had to complete as many as eight separate challenges. These included driving a utility vehicle over a short course, getting out of the vehicle and walking, removing rubble from a doorway and going through the door, climbing a ladder, using a tool to cut a hole in a wall, opening valves, and pulling a fire hose a short distance and connecting it to a standpipe. During the finals next year, Pratt said DARPA will combine all the tasks into a more authentic mission for disaster response. No matter how the finals turn out, the robot technology will have to be commercialized before it can be used in disaster response and mitigation, he said. “What the commercial sector can do is to find a market for the technology. It may not be in disaster response, it may be in health care, agriculture or manufacturing. We just don’t know,” Pratt added. “But the most important thing is, after DARPA does its work, we count on the commercial world to reduce the cost, find the markets and produce things of value,” Pratt explained, and only afterward can the disaster-response community put the robots to work in those applications. According to its DRC fact sheet, DARPA fully expects all those things to happen. WASHINGTON, Dec. 23, 2013 – Strategy and budget realities are two aspects of the Defense Department’s new Unmanned Systems Integrated Roadmap, released today. The report to Congress is an attempt to chart how unmanned systems fit into the defense of the nation. “The 2013 Unmanned Systems Integrated Roadmap articulates a vision and strategy for the continued development, production, test, training, operation and sustainment of unmanned systems technology across DOD,” said Dyke Weatherington, the director of the unmanned warfare and intelligence, surveillance and reconnaissance office at the Pentagon. “This road map establishes a technological vision for the next 25 years and outlines the actions and technologies for DOD and industry to pursue to intelligently and affordably align with this vision,” he continued. Unmanned aerial vehicles have received the most press, but unmanned underwater vehicles and ground vehicles are also providing warfighters with incredible capabilities. Although unmanned vehicles have proved their worth in combat operations throughout the Middle East and Central Asia, current technologies must be expanded and integrated into the sinews of the defense establishment, the report says. Of course, all DOD programs have to face the reality of the budget crunch. “Achieving affordable and cost-effective technical solutions is imperative in this fiscally constrained environment,” the report notes. Strategy really drives the technology. Unmanned systems will be crucial as the U.S. military shifts its focus to the Asia-Pacific region and puts the air-sea doctrine into effect. In the future, unmanned vehicles will be required to operate in more complex environments involving difficult weather, terrain, distance and airspace. All this will require extensive coordination with allies and host nations, the report says. “The road map describes the challenges of logistics and sustainment, training and international cooperation while providing insight on the strategic planning and policy, capability needs, technology development and operational environments relevant to the spectrum of unmanned systems,” Weatherington said. The United States Army announced today that the Army Cyber Command (ARCYBER) Headquarters will be located at Fort Gordon, Ga., consolidating and coordinating Army cyber and network operations under one commander for the first time in its history. "Cyber threats are real, sophisticated, growing, and evolving," said ARCYBER's commanding general, Lt. Gen. Edward C. Cardon. "The Army's decision demonstrates support for unity of command and the importance of cyber to our Army and our nation," he explained. The Army selected Fort Gordon as the permanent location for ARCYBER Headquarters for operational and cost reasons. Since its establishment in 2010, ARCYBER has been temporarily split-located in seven government buildings and leased space across the national capital region. The move to Fort Gordon will co-locate ARCYBER Headquarters with the Army's Joint Forces Headquarters-Cyber and NSA-Georgia, placing the Army's operational cyber headquarters with the majority its cyber mission forces. It will require 150 fewer personnel than other potential sites, as well as reduce military construction requirements and costs by 23 percent less than other considered options. Establishing the Army Cyber Center of Excellence at Fort Gordon will begin by aligning Army cyber proponency within the U.S. Army Training and Doctrine Command, creating institutional unity and a focal point for cyber doctrine and capabilities development, training and innovation. Before selecting Fort Gordon, the Army evaluated its ability to support U.S. Cyber Command-directed missions and other operational factors such as installation capacity, environmental impacts, and human resource considerations. Community input was also solicited and considered through an environmental assessment public comment period conducted in the fall. ARCYBER will continue to have a command liaison element co-located with U.S. Cyber Command at Fort George G. Meade, Md. For more information, please contact Army Cyber Command Public Affairs: Jennifer Downing at 703-428-6396; or Army Public Affairs: Lt. Col. Donald E. Peters at 703-697-7550 or Wayne Hall at 703-693-7589. The December 28, episode of American Heroes Radio features a conversation recognized law enforcement cybercrime expert Art Bowker, the co-author of An Introduction to Solving Crimes in Cyberspace. Art Bowker (@Computerpo) has over 27 years’ experience in law enforcement and corrections; and ,is recognized as an expert in managing cyber-risk in offender populations. In addition to co-writing Investigating Internet Crimes, 1st Edition: An Introduction to Solving Crimes in Cyberspace, he is also the author of The Cybercrime Handbook for Community Corrections: Managing Offender Risk in the 21st Century. Art is a lifetime member of the High Technology Crime Investigation Association (HTCIA) having served on its Executive Committee, including as President in 2008. In November 2013, he received the Federal Probation and Pretrial Officers Association’s (FPPOA) top award, the Richard F. Doyle Award, for having made the most significant achievement in, or contribution to, the Federal Probation & Pretrial Services System or the broader field of corrections. Art Bowker received the Thomas E. Gahl, Line Officer of the Year Award (Great Lakes Region Award), which is named in honor of the only U.S. Probation Officer killed in the line of duty. Both awards centered on his contributions and efforts in managing cybercrime risk. In January 2013, Art was recognized by the American Probation and Parole Association (APPA) with the Sam Houston State University Award for his writing contributions to promote awareness of cybercrime and tools for helping the community corrections field combat computer crime. He is a member of both FPPOA and APPA. You can learn more about Art, his work and interest at his website, Computerpo.com. The Watering Hole is police slang for a location cops go off-duty to blow off steam and talk about work and life. Sometimes funny; sometimes serious; but, always interesting. Lieutenant Raymond E. Foster was a sworn member of the Los Angeles Police Department for 24 years. He retired in 2003 at the rank of Lieutenant. He holds a bachelor’s from the Union Institute and University in Criminal Justice Management and a Master’s Degree in Public Financial Management from California State University, Fullerton; and, has completed his doctoral course work. Raymond E. Foster has been a part-time lecturer at California State University, Fullerton and Fresno; and is currently a Criminal Justice Department chair, faculty advisor and lecturer with the Union Institute and University. He has experience teaching upper division courses in law enforcement, public policy, law enforcement technology and leadership. 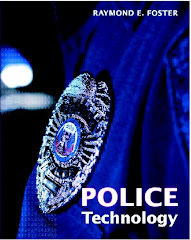 Raymond is an experienced author who has published numerous articles in a wide range of venues including magazines such as Government Technology, Mobile Government, Airborne Law Enforcement Magazine, and Police One. He has appeared on the History Channel and radio programs in the United States and Europe as subject matter expert in technological applications in law enforcement. WASHINGTON, Dec. 12, 2013 – Next week, 17 teams will take their multi-limbed, capable-looking robots through eight realistic disaster-response tasks that will make up the Defense Advanced Research Projects Agency’s Robotics Challenge Trials Dec. 21-22 at Florida’s Homestead-Miami Speedway. The best performers will determine the baseline for the state of robotics, Dr. Gill Pratt, DARPA’s Robotics Challenge program manager, said during a recent teleconference. And DARPA will fund up to eight of the highest-scoring teams for another year as they move on to the DRC Finals in 2014, after which one team will receive a $2 million prize.